What is Clash of Clans Forecaster? The creator of the website found a way to simulate the player behavior of Clash of Clans player all over the world. I was a little sceptic, in the beginning, but after having tried it out a couple of times I can say the indication is excellent! 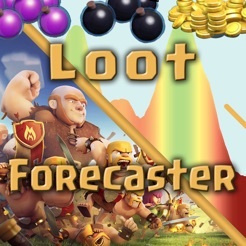 The forecast, however, doesn’t include League Bonus and directly simulates the generated loot that you can get. I do check this every time before I start some boosting on my Barracks or Spell Factories to not waste my time in a dry period! I know it’s not a free app (sadly), but investing that little might save you a much bigger amount of Gems you would waste in boosting to the wrong time. In the end, you can always use the website FOR FREE, and the app is only providing you a more convenient way to access that brilliant tool.